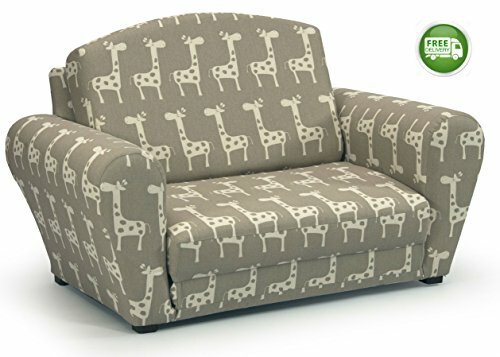 Children's Upholstered Sleepover Sofa Chair -Gender Neutral Kids Fold Out Convertible Armchair for Reading, Gaming and Slumber Parties - Two Fabric Choices for Space Saving Decorating by Fun Future at Indsight. Hurry! Limited time offer. Offer valid only while supplies last. FREE SHIPPING IS INCLUDED making this multi purpose furniture a great value and an easy purchase. The gender neutral giraffe pattern will please any child and will look great in any bedroom, playroom or family living room! YOUR CHILD WILL LOVE having their own cozy chair! You will love this seating that easily converts to a sleeping bed. So great for sleepovers, playing video games or doing homework. GREAT HOLIDAY GIFT IDEA! Whether as a present for your child or GRANDPARENTS, this chair equals Future Fun! CURRENT DESIGN & FABRIC CHOICES make decoration your child's bedroom or playroom a snap. The Neutral Giraffe and Black & White Splash are two fresh fabrics that will add to the decor of any children's room.